Getting locked out of your Windows account is a very common problem and there are several Windows password unlocker free download, available all over the internet. So, you don’t have to worry about such stuff anymore. But you also need to choose the best program among hundreds that will unlock your computer safely with efficiency. So, there are a few available that are considered the best among all of them. For your convenience those are listed below with details. This is an exceptional password recovery tool that works on Windows7/8/8.1/10 Vista/XP. You can remove or reset user or Administrator password using it. You can also remove or reset the password of Microsoft Account on Windows 10 and 8. You can create a new local domain account in order to unlock your locked computer. If you are hacked then you can also create a new domain admin account with it. Step 1: Download and install the program on your computer and then launch it. Choose USB from the main interface. 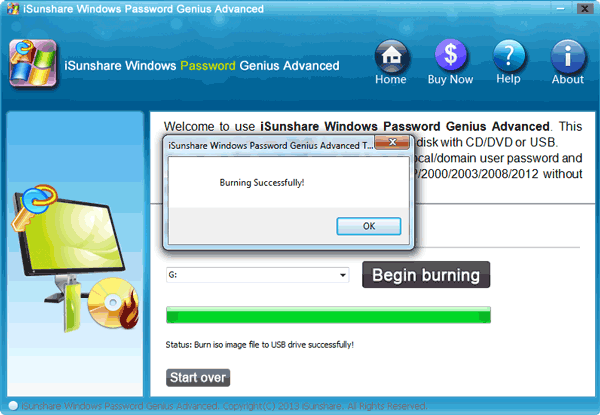 Step 3: When the data burning is complete, the USB drive will turn into a password recovery disk. You need to close the wizard to proceed. Tap “OK” to exit. 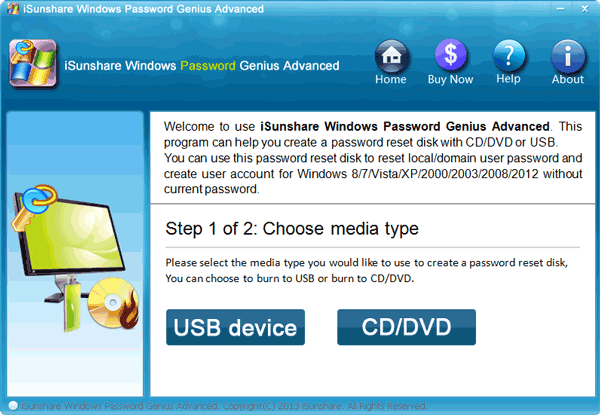 Step 4: Now, the password recovery process begins as you are going to connect that password recovery USB to the locked computer. Then, restart it. Step 5: Before the log in screen comes, start tapping “ESC” or F 12” to enter “Boot Menu”. Step 6: Now, select the USB and highlight the option using the Arrows on your keyboard and then tap “Enter”. Step 7: Finally, choose your “Windows System” and the account that is locked. After that, hit “Reset password”. Step 8: After the password reset is complete, reboot the computer. 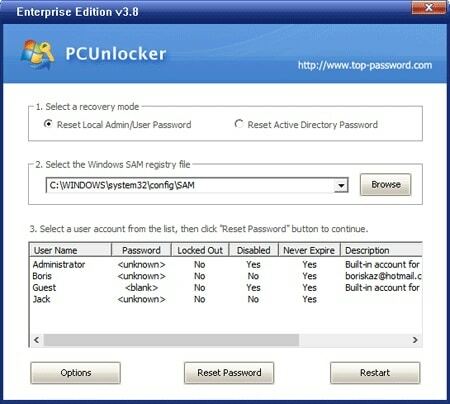 This is a very easy and flexible program and you will be able to reset the password of your computer with this Windows password unlocker, very easily. It is available for free trial. Very fast and compact program. 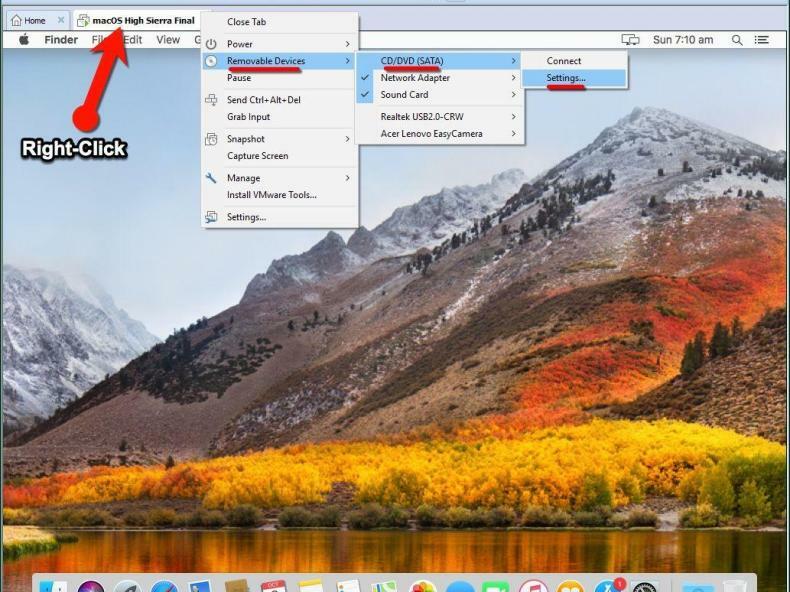 User-friendly method and works with every version of Windows OS. OphCrack can crack passwords for Windows 7/8/Vista/XP. It can also crack the Microsoft account password for Windows 8. It can use a slower dictionary attack, which is slow but very effective. The LiveCD option provides automatic password recovery. 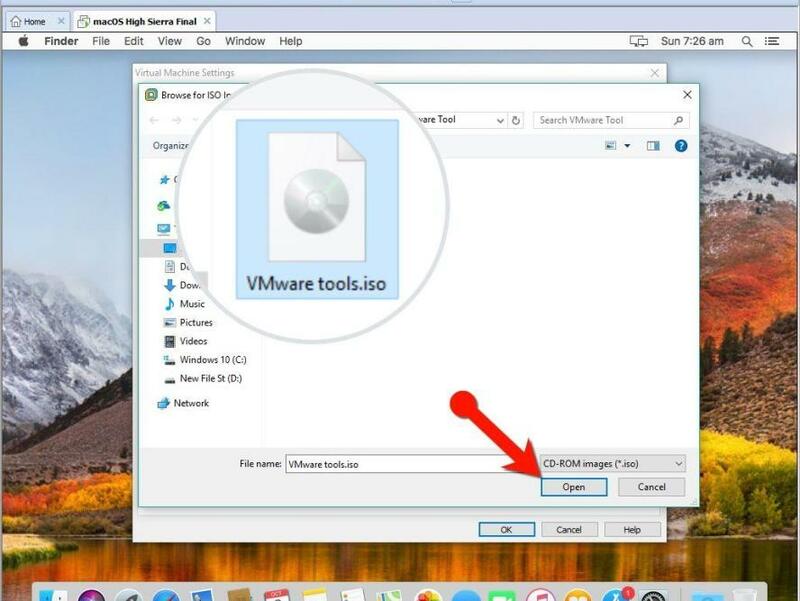 Step 1: So, you need to download the image file on your computer. It is a very small program, takes only about 700 MB space. Step 2: Now, you need to use a program to get that image into a CD and then use it into the locked computer. Step 3: Now, restart the computer and access the Bios menu. Meanwhile, change the boot device to CD/DVD. Step 4: Then, you will be asked to select the Graphics Mode. So, choose the “Ophcrack Graphics Mode-Automatic”. Step 5: Then, boot from the CD and the program will launch itself. It is a quite different method than the first one and takes a long time to complete but it is very effective. It is a free program available online. The passwords can be removed automatically using the LiveCD method. You don’t need to remember the old password. You have to turn off any anti-virus you are using. You need to burn the program on a CD. If the password is more than 14 characters then OphCrack will not be able to do it. Capable of deleting password almost instantly. It is also a good Windows 10 password unlocker, also works on Windows 8 but only for local account. Step 1: Download and burn the ISO to a CD. It does not require any installation. Step 2: After the bootable disk is made, insert it into the locked computer. Restart it and the program will be loaded. When, you see “Boot” on the screen, press “Enter” to initiate the process. Step 3: It will first identify the partitions and you need to select the one where the OS is installed. Step 4: After choosing the partition you need to choose all the default choices and hit “Enter”. Then, you have to enter the user name for the locked account. Type it and hit “Enter”. Step 5: Again choose the default option and hit “Enter”. Now, you have to choose to clear the password for the account. Step 6: Now, that the password has been cleared, you need to exit. So, you have to press “!” and hit “Enter”. Then, type “q” and hit “Enter” again. Step 7: Finally, type “y” and hit “Enter”. You have to press enter again to confirm. The procedure is complete. Now, you can remove the disk and you will be able to enter the Windows computer without any password. It is capable of recovering the password very fast. The size of the program is very small compared to other similar programs. The user has to burn the image on a disk. It is completely text based which is too complicated for most of the users. The interface is user-friendly but the process itself is complicated. Step 1: Download the LCP ZIP from the internet and then unzip it. Launch the program. Step 3: After the file is uploaded you will see a table on the screen. The NT Password column will be completely blank for any user account with password. If it does not then you will see “NO PASSWORD”. Step 4: If the NT Password field is black beside your user name then you will be able to recover the password. Now, click the Play button to start. Step 5: There are different types of attacks available and you have to choose one of them. The procedure will take a few hours to complete. 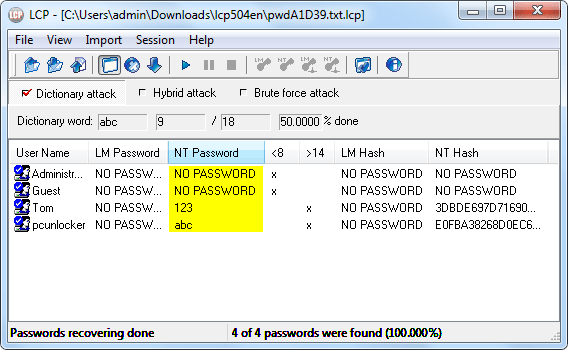 If the password cracking was successful then the recovered password will be visible against your user name at the NT Password column. The installation is very quick. You don’t need to burn the program on a disk. It does not work with new Windows OS. It does not get any updates anymore. You need to have access to Windows to use it. PC Unlocker has a great recovery rate. You can reset the passwords of local or admin accounts. 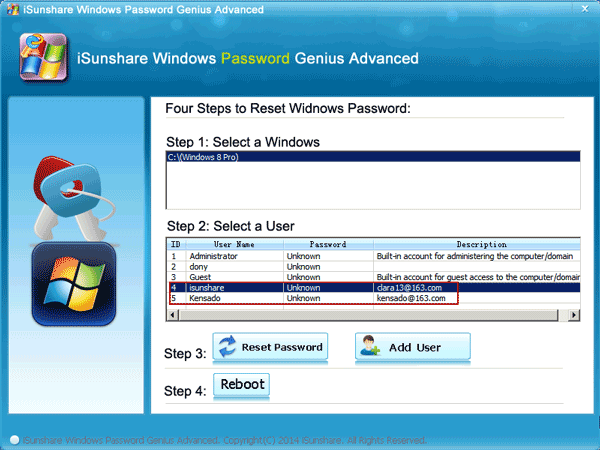 You can bypass the Windows user account without changing the old password. You can reset password of Microsoft account on Windows 10 and 8. It supports various versions of Windows OS, new and old ones. Step 1: Download the program on your computer. It comes in a ZIP, extract it and you will find the ISO file in there. Now, you need to use a program to burn that image to a disk or to a USB drive. Step 2: Open the locked computer. 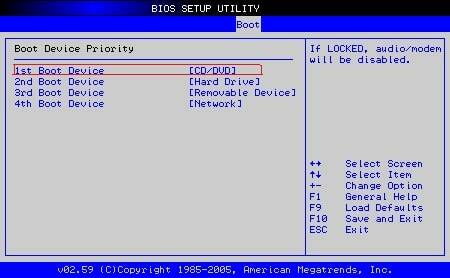 Enter “Bios Menu”. Select the USB drive as the first boot priority and press “F 10” to save. Step 3: Connect the USB drive to the computer and restart it. The program will start to load and the PC Unlocker main interface will be on the screen. Step 4: You have to choose your Windows SAM registry file and the program will detect all the user accounts. Now, select your user account and click on the button called “Reset Password”. After the procedure is completed you need to click “Restart” the computer and disconnect the USB drive. Now, you don’t have to provide any password while access Windows again. The installation is very easy and simple. Bootable media creation is available. The process is fast and safe. Most of the time, it takes too long to make the bootable media. Each of the Windows Password Unlocker is really good at their own accords but there are several issues with almost all of them. The LCP is very old and does not get any more updates, the NT Password Registry is effective but text based; basically, it is very complicated for most of the users. OphCrack does not even work with the Windows 10. PC Unlocker is good, in fact, it is great but making the bootable media takes too much time. Where every program is fast, it is very slow. So, basically, the choice is Windows Password Recovery Tool. It has no such flaws and it is hands down the winner here!